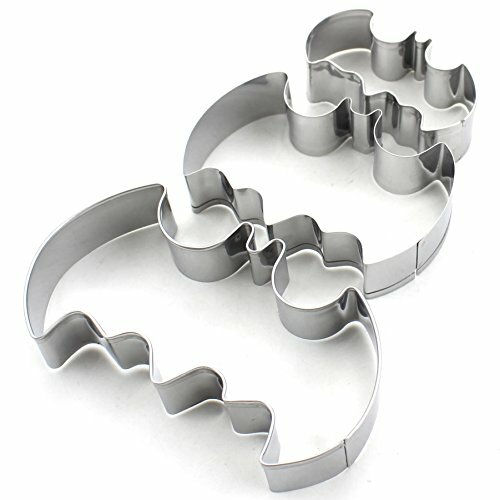 Treat friends and family to a fun batch of cookies in every iconic Halloween shape. 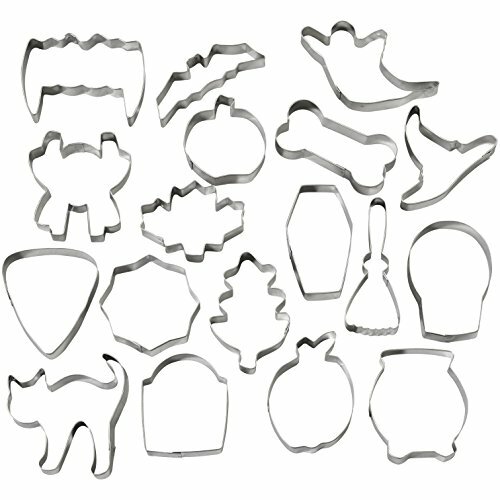 Kids love choosing from this 18-Piece Halloween Cookie Cutter Set. You’ll have fun decorating the iconic shapes, perfect for a Halloween sweet table or gifting. Set Includes: broom, oak leaf, cat, pumpkin, bat, candy corn, maple leaf, cauldron, coffin, witch hat, bone, ghost, spider web, apple, spider, skull, tombstone, vampire teeth. 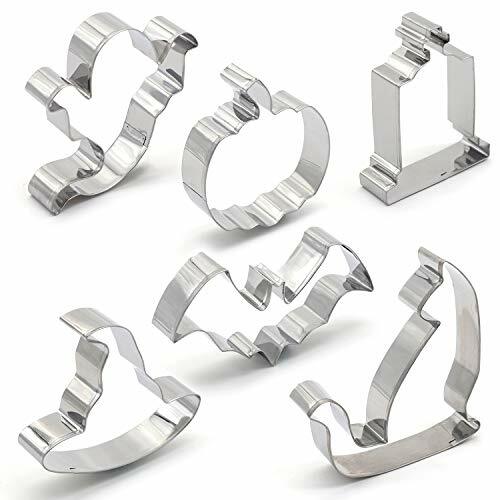 This metal cookie cutter set cuts beautifully defined shapes and is easy to clean because they’re dishwasher-safe. 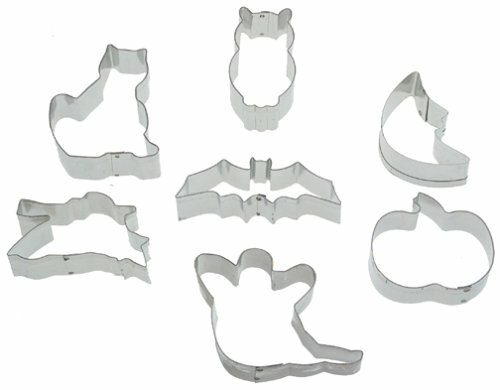 Assorted set of 9 metal cookie cutters. Included shapes: Acorn, Banner, Oak Leaf, Cat, Vampire Teeth, Bat, Coffin, Skull, and Tombstone. Wilton Cookie Cutter Comfort Grip Bat. 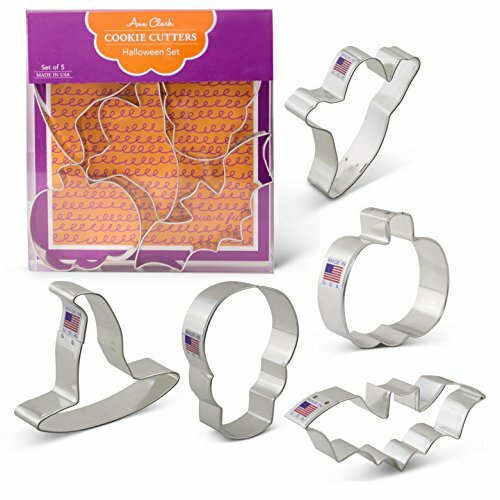 Item 2311-1356 Oversized Comfort-Grip Cutters help you easily create more exciting cookies, desserts, treats and crafts! 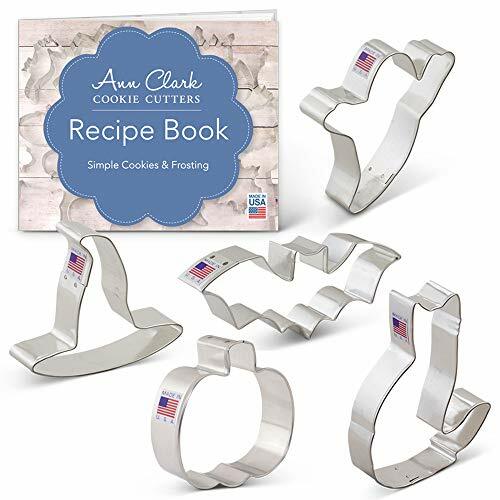 Plastic Cutting edge The high sides make it easy to cut thick dough and dense desserts and the cushioned grip makes every cutting job easier on your hands! These cutouts are a great addition to add some extra fun to your party. Place these cut outs around your house, on the walls, mirrors, and tables! These mini skulls cutouts are perfect for any spooky theme or Halloween party! These are great on their own, and are even better with the other decorations, costumes, and accessories available in our store! These cutouts are a great addition to add some extra fun to your party. Place these cut outs around your house, on the walls, mirrors, and tables! 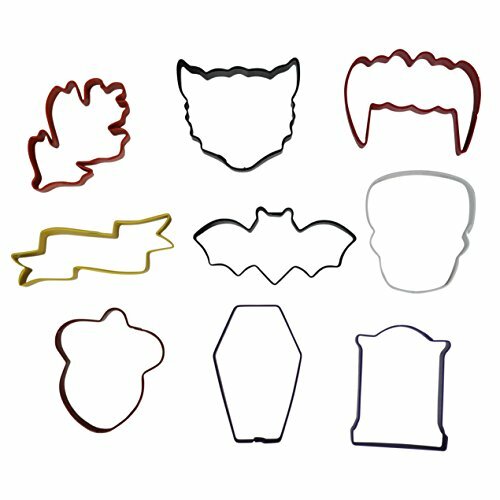 These Halloween character cutouts are perfect for any spooky theme or Halloween party! These are great on their own, and are even better with the other decorations, costumes, and accessories available in our store! Decorate your Halloween parties and more with Vintage Halloween Fluorescent Cutouts. It includes assorted halloween design cutouts. It can be used for decorating your party walls. 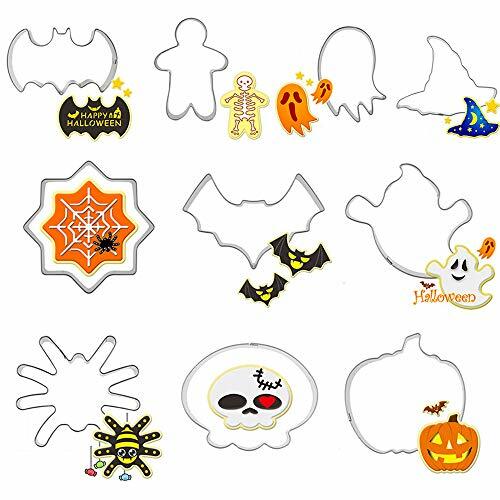 You can use it in holiday party.Vintage Halloween Fluorescent Cutouts.Size: 8½"-13¾".Color: Multi-Color.Attractive design.One (1) per package. Features: -Printed 2 sides. -Made in the USA. -Halloween collection. Product Type: -Decorative Accent. Holiday / Occasion: -Halloween. Season: -Fall. Dimensions: Overall Height - Top to Bottom: -24.5". Overall Width - Side to Side: -9.5". Overall Depth - Front to Back: -0.01". Overall Product Weight: -0.47 lbs.